Rose hip oil is harvested from the seeds of the small crab-apple-resembling fruit that remains on the rosebush after flowering. The oil has been used in folk medicine for centuries for its phenolic antioxidant compounds, essential fatty acids and vitamins A, C and E. The healing anti-inflammatory properties of rose hip oil are of value in skin-care products and may benefit aging or damaged skin. Collagen production in your skin naturally decreases as you age, and with that comes wrinkles. Vitamin C aids in cell regeneration and is necessary for collagen synthesis. Rose hips provide the highest content of Vitamin C of any fruit or vegetable. A clinical study published in the journal Clinical and Investigational Dermatology in 2015 used a topical 5 percent vitamin C solution with rose hip oil (rich in vitamins A, C, E and essential fatty acids) to evaluate the role of vitamin C as a viable anti-aging ingredient. Researchers found that the vitamin C compound proved to be a highly effective skin therapy by stimulating significant collagen production after 60 days of topical use. The study concluded that the vitamin C in rose hip oil is an efficient rejuvenation therapy without side effects. Aging skin is less able to retain moisture, and dry skin can cause itching, flakiness, wrinkles and eczema. Topical application of polyunsaturated fatty acids may play a critical role in normal skin appearance and function, says the Linus Pauling Institute. Rose hip oil is a good source of polyunsaturated fatty acids, including linoleic and linolenic acid, which are easily absorbed by the skin to help hydrate the protective outer skin layer for a soft, supple appearance. A study published in The International Journal of Food Properties in 2014 found that rose hip oil is a good source of phytonutrients and polyunsaturates that display antioxidant properties. Rose hip oil is rich in vitamin A. This vitamin contains unsaturated compounds, including retinol, retinal, retinoic acid and provitamin-A carotenoids. Retinol, a major ingredient in many over-the-counter anti-aging skin-care products, exerts potent effects on the skin through its conversion to retinaldehyde and then to retinoic acid. Retinoic acid regulates genes and affects cellular processes in both the outer and underlying areas of the skin, according to the Linus Pauling Institute. Facial skin damage accelerated by ultraviolet radiation from sunlight is known as photoaging and often leads to unsightly features such as uneven discoloration and spots on your skin. Not only do the anti-inflammatory and antioxidant properties of rose hip oil aid in reducing these skin-aging signs, but they may inhibit the over-production of melanin, which is responsible for the pigment in your skin. In a 2017 study published in the International Journal of Molecular Sciences, researchers compared the medicinal effects of different species of rose hips. They found that some compounds in rose hips may offer protection from UV-induced inflammation and damage. Specifically, the researchers determined that rose hip oil may be capable of inhibiting and reducing melanin content of animal melanoma cells. The study concluded that the antioxidant and fatty acid content were major contributors to the ability of rose hips to increase cell longevity and prevent cell membrane damage. 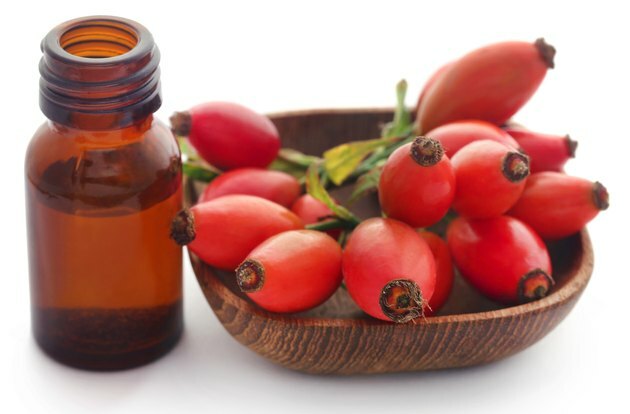 Rose hip oil is not only known as effective for anti-aging skin benefits, but for cosmetic improvement of skin scarring, including scars from injury, surgery, blemishes and acne. In 2015, the Journal of Cosmetics, Dermatological Sciences and Applications published results of a study demonstrating that rose hip oil aided the improvement of discoloration, redness and degeneration of cells in post-surgical skin scars. The study group treated with rose hip oil twice a day for 12 weeks experienced a greater reduction in scarring than the control group. Before using rose hip oil, do a skin patch test first. Apply rose hip oil to a small area of your skin, cover and leave for 24 hours. If the oil causes irritation, rinse thoroughly and don't use rose hip oil. If you experience a severe irritation, call your doctor. Healthline: What Are the Benefits of Rosehip Oil?